When it comes to brushing your dog’s teeth, the process is going to go one of two ways. You’re either going to end up with a dog running away from you because they completely hate it, or you’re going to have a dog that’s sitting patiently in front of you, waiting for the chance to eat all of the toothpaste off of the brush. With the Virbac CET poultry flavored dog toothpaste, you’re going to figure out that the second scenario happens a LOT more often than the first. Let’s face it. Most dogs aren’t going to be too keen on you coming at their face with a toothbrush. With the Virbac CET toothpaste, though, you’ll get them to let you stick a brush in their mouth. 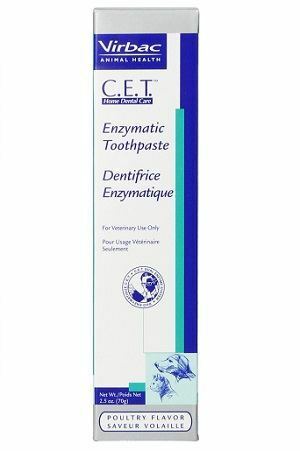 Natural Antibacterial Formula: A toothpaste isn’t just for removing built up plaque and tartar on your dog’s teeth. It also needs to fight off the bacteria that cause the tartar and plaque to begin building up in the first place. Virbac CET toothpaste has a natural antibacterial formula that prevents the buildup, while also reducing your dog’s risk of developing gum disease and tooth loss. Eliminates Bad Breath: German Shepherds can have some kickin’ breath sometimes. The only way to get rid of the smell is through taking proper care of their mouth. That starts with brushing their teeth, and then making sure that they have access to plenty of water throughout the day. Doesn’t Foam Up: The last thing you want to worry about is having your dog, foaming at the mouth, running away from you and getting the foam all over your house. The Virbac CET toothpaste doesn’t foam up like some other toothpastes that are “designed for dogs”. Given By Vets As Samples: If you ask your vet about brushing your dog’s teeth, chances are good that they’re going to hand you a small packet of Virbac CET and tell you to use it. There’s a reason so many vets trust the Virbac brand in their practice -- because it’s effective, and affordable. Makes Brushing Easy: The real poultry flavor is one of the biggest selling points of this toothpaste. Your dog’s are going to think that this toothpaste is a treat, and actually look forward to you getting it out from the bathroom cabinet. Metal Tube Is Hard To Manipulate: A few customers have said that they would rather see a plastic tube, instead of the metal tube that Virbac packages the toothpaste in. They’ve stated that it can be hard to manipulate, especially as you begin to run out. Some Dogs Would Rather Eat It Than Let You Brush Their Teeth: You may end up having to deal with the problem of your dog wanting to eat more of it than they actually let you get on their teeth. To alleviate this problem, it’s always best to use an extended toothbrush, and get the toothpaste deep into the bristles. 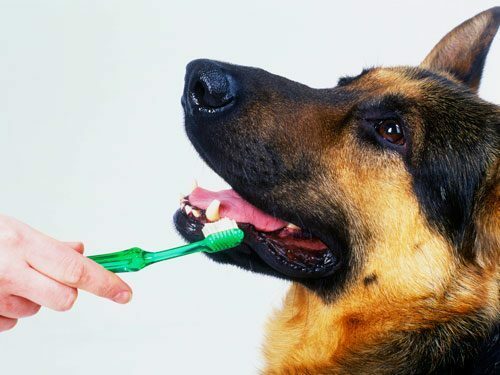 Brushing your dog’s teeth doesn’t have to be a tedious process. With the Virbac CET poultry flavored toothpaste, you can actually trick them into thinking it’s treat time, and get them to look forward to it every time you break out the tube. Click on the button below, and see how many other customers had that exact problem.